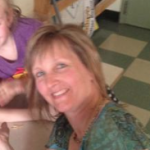 My journey into action research began during the 2012-2013 school year with an email from the Newfoundland and Labrador English School District, encouraging all teachers to apply for a unique and exciting professional development opportunity. Memorial University was inviting teachers throughout the p rovince to participate in a research project entitled “Fostering the development of primary/elementary teachers’ practical wisdom for teaching STEM (Science, Technology, Engineering, and Mathematics): Possibilities and challenges”. 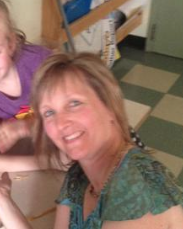 Under the leadership of Dr. Karen Goodnough and supported through a generous contribution from the Hibernia Management Development Corporation (HMDC), the aim of the project was to support teachers in fostering active, inquiry-based K-6 student learning in STEM education. Through a series of professional development activities involving teachers and their students, teachers would have the opportunity to enhance professional practice and student learning in STEM disciplines. Immediately my interest was piqued; as a graduate student of the Faculty of Education at Memorial University, this was an exciting opportunity to support my academic endeavors with authentic learning based on research and assessment data garnered from my own teaching practice. 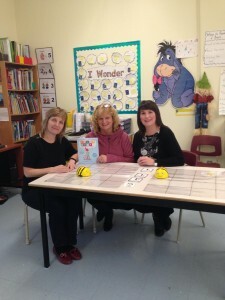 Joining forces with 2 other colleagues who also had the same interest in utilizing technology and innovative practice to support student learning in Science and Mathematics, the STEM Sisters were successful in becoming part of the Teachers In Action group at Memorial University of Newfoundland. To date the STEM Sisters have completed research on utilizing inquiry based teaching and learning in the primary classroom as well as enriching Science and Mathematics learning through design process and creative engagement. Our projects can be viewed at www.stemsistersnl.com. How does design-based learning activities such as coding enhance the logical, analytical and critical thinking skills of Grade Two and Three students? How does the iterative nature of coding improve the skills of risk-taking and perseverance in primary students? How does a coding environment affect skills of creativity, communication and collaboration? How would I teach such a seemingly abstract concept like coding to a group of young seven year old students? How would I make the concepts of computational thinking real and authentic for all learners? Children’s literature has always been an approach that I use to help children connect with new concepts and so I discovered a brand new resource that would assist me once again. Hello Ruby: Adventures In Coding, written by Linda Liukas, is a children’s book that guides the reader through 9 mini-lessons on computational thinking. Through the eyes of the determined character Ruby, my students quickly learned programming concepts as well as the perseverance that is needed to solve problems. 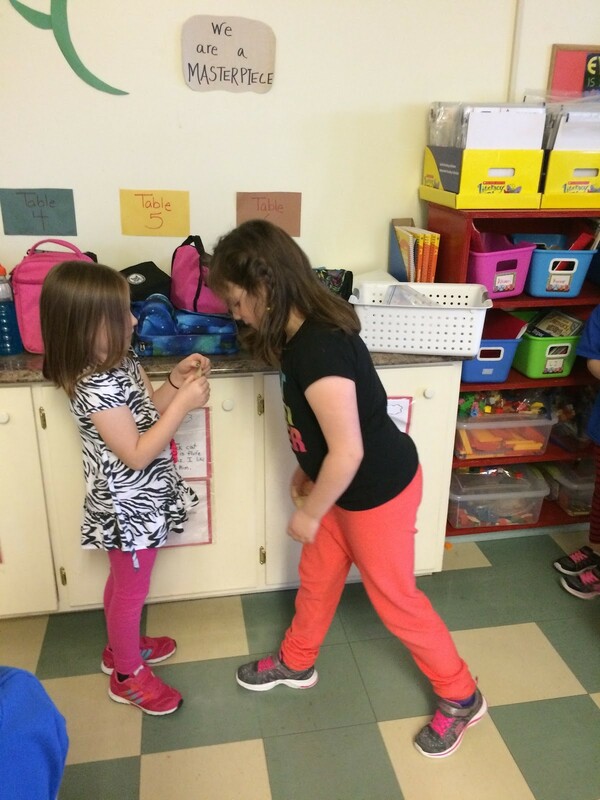 They became familiar with concepts of directionality and the ability to break tasks down into their composite parts. This new learning paved the way for our first coding lesson; a kinesthetic approach that did not require any technology whatsoever! Through guided practice and modelling, I demonstrated how I could write a line of code to program a “robot friend” to move left, right, forward and backward. The children were instantly engaged and excited to partner with another student, writing and reading a variety of codes as they took turns being the programmer and the robot. At the end of the day when we reflected upon the activity, the students were quick to make many interesting comments about their new learning. One such comment that all students expressed was the need to be very specific when you write code. Many of my junior “programmers” discovered that their robot friends didn’t move the way they wanted them to move because there was a step in the code that was missing. In fact, many of my students likened code writing to procedural writing, a language arts lesson we had completed in the previous month. 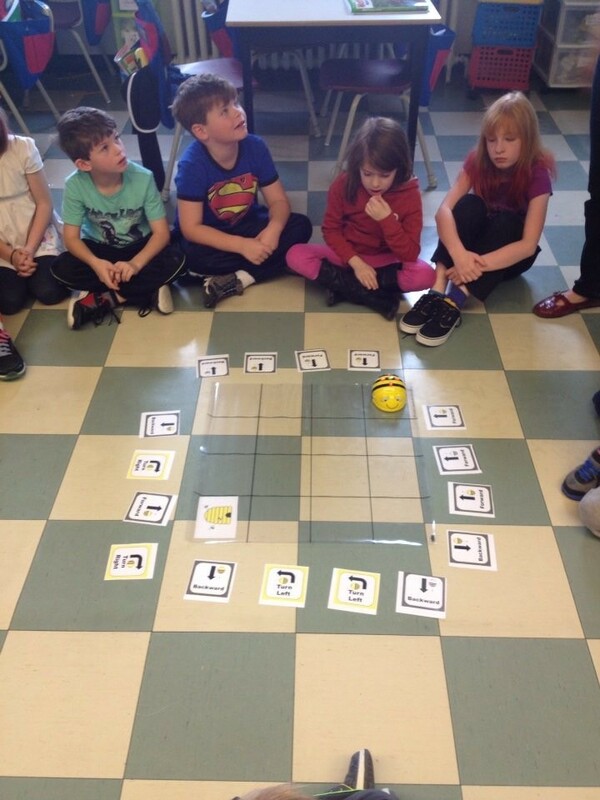 Little did they know that this unplugged coding lesson had indeed set the stage for more coding adventures; adventures using Beebot technology! Beebots are small robots designed to be used by young children to teach sequencing, estimating, and prob lem solving skills. Using the forward, back, left and right push buttons located on the top of the beebot, teachers and students can have the yellow robot move about by programming a sequence of steps. Having already used a kinesthetic approach to program our human friends, my students were eager to find out more about this new little character. As we sat on the floor in a circle, I introduced my Beebot and the many things he could do. Excited chatter could be heard around the classroom as I demonstrated how I could make this little guy move the way I wanted him to move simply by programming a line of code using the buttons on his back. The students immediately connected to the new learning as I displayed the matrix mat as well as a series of coding cards that I had previously printed and laminated. True to the inquiry method, I asked “I wonder if we can help our beebot find his way home to the beehive? Can we write a code that will take him there?” With an enthusiastic “Yes!!! 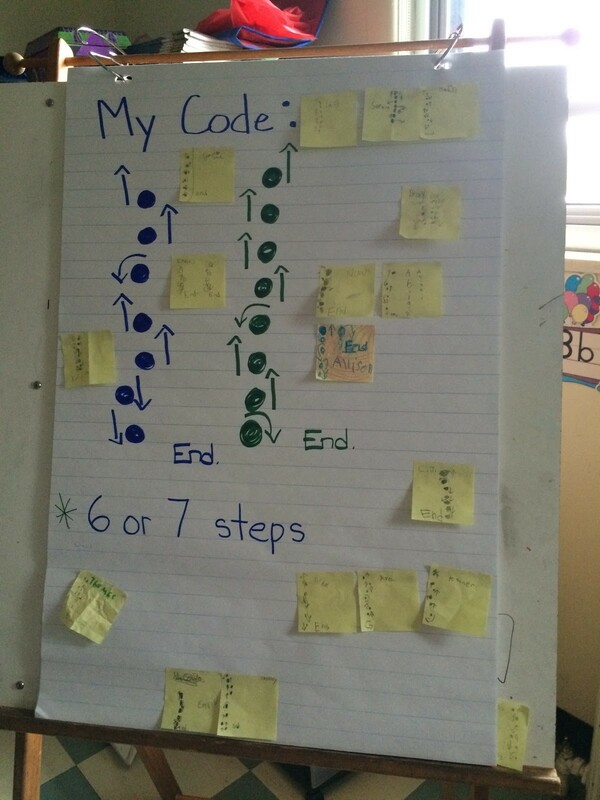 !” students immediately began the process of telling me the sequence of steps that the beebot needed to follow in order to get home. As each step was relayed, we placed the corresponding coding card onto the chart stand until we finally came to the end. 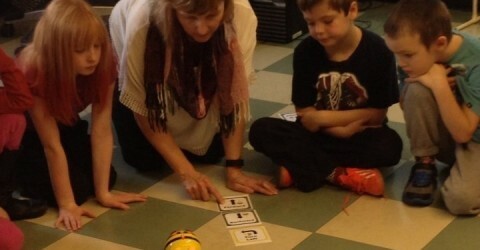 I programmed the ten lines of code into the beebot and then we counted down…3, 2, 1….Go! The beebot methodically went through each step, stopping, blinking and beeping as each line of code was executed. As he neared the beehive, the students became more and more excited. Finally, at the last line of code the beebot took an unexpected turn and went off the mat instead of going to his home. A huge sigh of disappointment was quickly followed by a chorus of voices telling me how to change the code so that the beebot would successfully get to his final destination. The students had figured out the debugging process without ever being formally taught this concept AND they were motivated to do so. You can see the final result of our test in the video below. In the days following this introductory activity students continued to work with the beebots, attempting to write shorter codes to achieve the same result and creating new paths for the beebot to travel while implementing barriers for him to overcome. Students were doing Math and they were excited about their work! And every child, regardless of ability, was participating and achieving success! As a primary teacher, I was truly excited to be witnessing this turn of events. My first attempts at utilizing coding as a methodology for teaching problem solving and critical thinking have been quite successful. Needless to say the added benefits of improved student motivation, perseverance and risk-taking are also evident. I am excited now to introduce my students to Scratch programming as I continue to explore computational thinking as a means to improve creativity, collaboration, and communication while designing multi-media games and applications. Stay tuned for more exciting adventures!